Station adoption work can be fun – but it can be hard work! First of all, there is the opportunity to meet new friends from the village – people you probably have seen for years and never realised what interesting people they are. 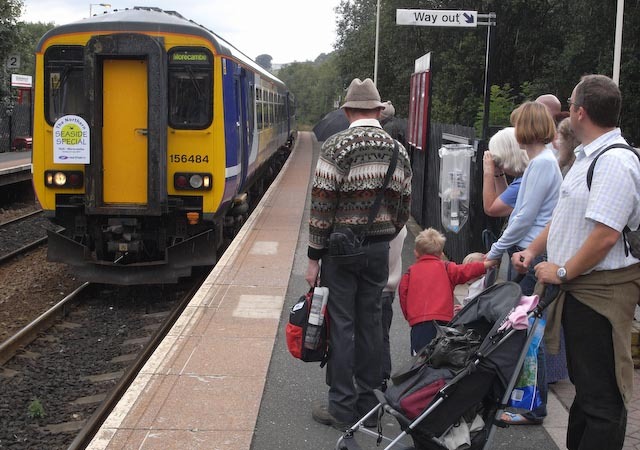 Then there are the trips arranged by Northern Rail to show appreciation for our improvement work. Last summer our next generation of volunteers went to Morecambe on a Stakeholders’ Special. Last month, some of the ‘cultured’ ones went to a concert in the train depot in Manchester. We have further trips in mind for our volunteers after the Yorkshire in Bloom judging. So, it can be hard work – but it can also be fun – why not come and join us? Further information on our work meetings and events can be found by scrolling down. If you are not into physical gardening/construction-type work – but more into background admin work then you might phone me on 885154 – there is lots to do – particularly fund-raising for the community projects the Mytholmroyd Station Partnership has become known for nationally. It has to be pointed out the the Station Partnership is NOT an ‘Action’ or campaign group – we simply work with Northern and Network Rail to improve our village railway station. We have an excellent relationship with managements of the public transport undertakings, and discuss any problems affecting our volunteers and Mytholmroyd. Most of our meetings do not even mention trains – we have so many other projects to plan and implement.